Group Drop-In / Strata-Approved Residence / Retirement Living / Private or Semi-Private Sessions available: Classes are suitable and modified for all ages, abilities and backgrounds. Subsidized Pricing: In keeping with my goal to make yoga and its therapeutic benefits accessible to all, and to promote the overall health of our community, please don't hesitate to contact me if you are on a low income to discuss services on a voluntary price scale. Recover fully from the stresses and strains of life by consciously relaxing muscles, lowering your heart rate and allowing your nervous system to stop reacting constantly. A restorative practice aligns the physical and mental through practicing stillness and gentle movement for extended periods of time. Props (bolsters, straps, blocks, blankets, eye pillows) assist in helping to comfortably hold poses longer. For some this is the most challenging class you're going to take. It's also where you may find the greatest capacity for growth, deep relaxation, and true well-being. Chair yoga is a gentle style of yoga that adapts yoga poses with use of a chair. 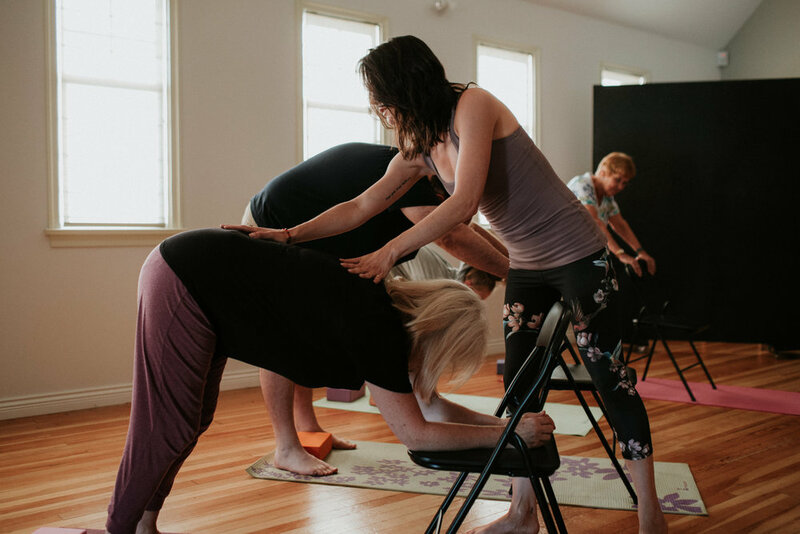 Poses are done seated or using the chair as a prop which allows for greater stability to help you feel supported and safe. Poses are modified so those with health restrictions, decreased range of motion, and physical challenges can enjoy the benefits of a more traditional practice. Emphasis is on breath, balance, and range of motion. Participants are encouraged to listen to their body; no suffering and no judgment! Chair Yoga is suitable for all ages and ability levels. A slower practice emphasizing balance of postural alignment and breathing techniques to stretch and strengthen your body with gentle transitions and minimal weight bearing on your hands. This practice brings calmness, connection, stress reduction, and a feeling of overall well-being. An essential aspect of recovering from trauma is learning ways to calm yourself, or self-regulate. Through a comforting trauma-sensitive yoga practice we experience the relaxation response of coming back to our body and mind. Research shows that yoga practices, including meditation, relaxation and breath work, and the physical postures, can reduce fight or flight reaction, muscle tension, and blood pressure, improve stress-related symptoms, decrease physical symptoms and emotional distress, and increase quality of life. connect TODAY to book a SESSION or REGISTER FOR A PERSONALIZED TRANFORMATION PROGRAM !